After an easy paddle from Coconut Beach you’ll find this A-frame wave. Beware on the way back the currents close to the cliff can be strong and make it hard to access the beach again. Take-off mellower than the other surf spots in Nusa Lembongan. The right is short and can close on the first section making it even shorter, but the left offers an open wall to draw nice turns and longer rides, great for single fins. A-frame wave on a small to medium swell, perfect spot to practice catching a nice green wave for beginners and intermediates. Access by boat with your surfschool only. Right and left are suitable for longboards, shortboards. When the tide starts to drop the wave gets hollow and faster, great for learning, improving and fun ! On bigger swells the left closes out but the right offers an amazing barrel, very fast and steep. Challenging and only for the most experienced surfers. Good left-hander choice when the swell is medium. Longboarders come at full-tide to get the longest fastest hang-ten of your life, while on mid-tides it gets more hollow and perfect for shortboards. On the big swell days you can see it breaking perfectly from the shore, big and very fast. A picture not to miss. 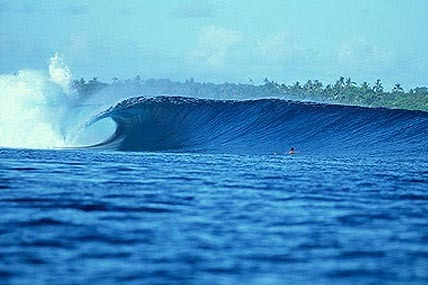 World-class right hander unfortunately victim of its popularity : can get very crowded with high-experienced surfers. But the ride is really worth the wait. When working at its best the first section unfolds gently, offering a nice long bottom-turn to position yourself in the pocket of the awesome barrel of the second section…wait it’s not finished yet ! After a big smile and a photoshoot of your barrel the waves continues to unfold on a third section smaller but open wall to practice these sharps turns. When the winds or swell direction isn’t good the first section will close out and you’ll have to start at the second section. Check conditions on Magicseaweed first. Currents can be hectic and making it really hard to stay on the line up. Experienced surfers only ! Easy access after a long motorbike ride over the adventurous yellow bridge, Ceningan has the best swell exposure of all the surf breaks in Nusa Lembongan. Fast closing wave great practice for making speed and sometimes closing out exits. Protected from Tamarind Bay, this surf spot appears only on 4ft+ swells. The take-off area of the wave is very narrow and has not much shoulder to offer but it is fast and barreling offering a unique experience. To have the chance to try most of these surf breaks stay for a week with us at our surf beach retreat. Beginner surfer = please don’t go in the water by yourself without an instructor. Your inexperience can cause you to be at the wrong spot at the wrong time, putting yourself and other people in danger. Follow our package 3 beginners surf lesson and you’ll learn the basics about what to do and not to do in the water. Intermediate surfer = ask first how are the conditions before you get in the water. If it’s your first time on the reef we highly recommend you our introduction to the reef intermediate course. 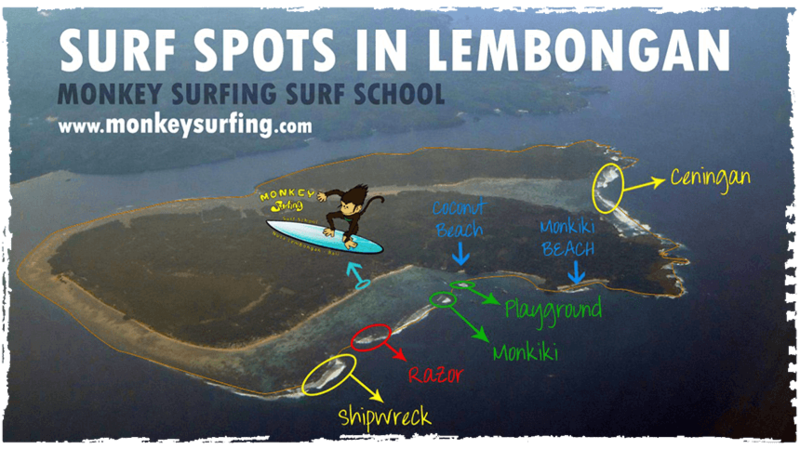 Advanced surfer = Nusa Lembongan surf breaks have a lot of potential and we would be pleased to help you find your perfect spot. You can also join our surf guiding for a best experience. Of course if you have any question feel free to contact us here !